Closed die forging is used as a single-pass process for the production of very simple forgings and as a multiple-pass process for parts with complex shapes. Multiple-pass forging includes preparatory operations (shaping of blanks), which is followed by the final stamping. Multiple-pass forging is performed on mechanized or automatic equipment, in hydraulic presses capable of a force of up to 750 MN, with hammers whose dropping components develop 20–25 tons-force, on hot-stamping crank presses capable of developing a force of up to 80 MN, on automatic machines for single-position and multiposition stamping, on cold-pressing machines and rolling-out machines, on forging mills, and on other specialized equipment. Stamping in hydraulic screw presses and with high-speed drop hammers makes possible the production of thin-walled forgings. Closed die forging is operated in Fly Forge is hot forging process, which is performed after heating to 200°–300°C; the temperature depends on the composition of the alloy and the processing conditions. The initial round bars divided into uniform blanks that are equal in volume to the future forgings (taking into account unavoidable waste). The weight of the resulting articles ranges from several grams to 6–8 tons; the dimensional precision of the forgings depends on their weight and configuration and may be increased by subsequent cold sizing; and the surface finish corresponds to grade 3–7. Hot forging in closed dies is used to produce steel forgings of uniform structure, relatively high precision, and complex configurations, which cannot be achieved by free forging. Dies for closed die forging are most frequently of the two-part type, consisting of top and bottom halves, or a punch and die. In closed die forging process , the bottom half of the die is usually fixed, and the top half is movable. And the flash is cut off in the die by means of a cutting press. Due to the advantages of closed die forging, this technique is widely used to produce components for various applications. For its wide range of material specifications and shapes,closed die forging can be useful for lots of metal components,such as componets for aeroplane,cars and heavy trucks,shipbuilding,ect. With the characteristics of closed die forging, we can make precision components with different wall thickness, complex shapes, narrow tolerance. And we are all equiped with full range of machining equipments, so machining is also feasible in our company. 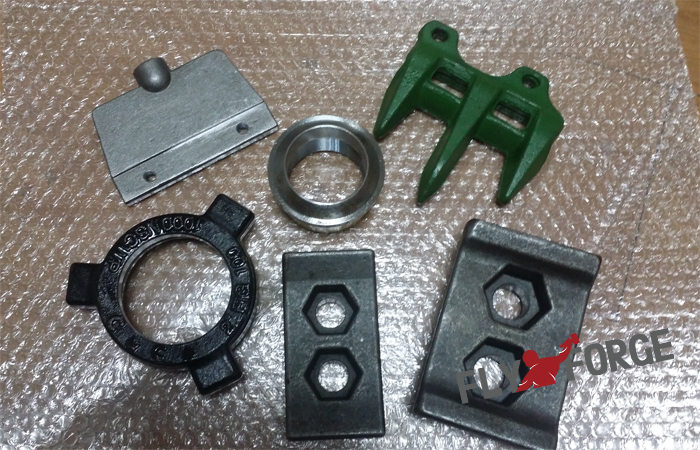 Maybe sometimes you could also consider casting process instead, but by comparison, there are both price and quality advantages over casting, we will no need to worry about production defect. Forestry Application: Mulcher replacement teeth, Tub grinder teeth, Flial hammer blade, ect. Lifting and Rigging Application: Shackles, Weld on D ring, Hooks, ect. Looking for closed die forging service in China? Contact us now!